Finally managed to extricate myself from the gorgeous island of Lipe although it has to be said the ferry company to Langkawi make very hard work of the border transition to Malaya. 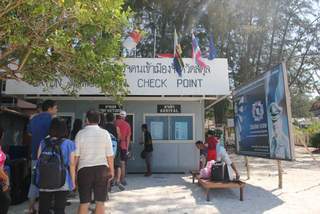 As in lets traipse everyone down the Lipe beach & back to get their passports stamped and then dump said 54 passports in one big bag & try and find their owners on the boat 🙁 Total & utter nightmare. If all passport controls were like this..
Didn’t really like Langkawi very much apart from getting a new SIM – £12 for 4.5GB of data & the Starbucks 🙁 so I rapidly booked the high speed ferry to Penang, excellent, although it has to be said I get very confused by young guys dressed in western clothes dragging along their women in full burqas, such blatant hypocrisy & denial of rights really upsets me. 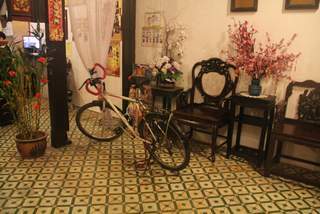 Penang seems very pleasant and I found The Muntri House homestay very welcoming with the bike taking pride of place in the foyer although not sure about going on a hike in the night to find the loo 🙁 However, it’s only for one night as they are full tomorrow.. Apparently no bikes are allowed on the bridge to the mainland so will have to take a short ferry across to Butterworth on the main peninsula so I can get biking again.